Kirsten wrote a post about why he prefers to use burn-up charts to help make informed planning decisions during development. We’d been using Excel to log our data and create the chart, but found it pretty painful for a number of reasons. We eventually realised that we weren't really using the chart routinely which was a shame as the tool is really valuable for making project planning decisions. We also figured that if we found the tool useful, there must be others who would benefit. Lots of tools currently available are quite restrictive in how they’re used. For example, some force you to use Trello in a certain way, some use set user story sizing methods, or some require that you use a full-blown project management tool and the charts are an add-on. None of these options really appealed to so we decided to build a lightweight tool that doesn’t get in the way of how a project is run or managed. 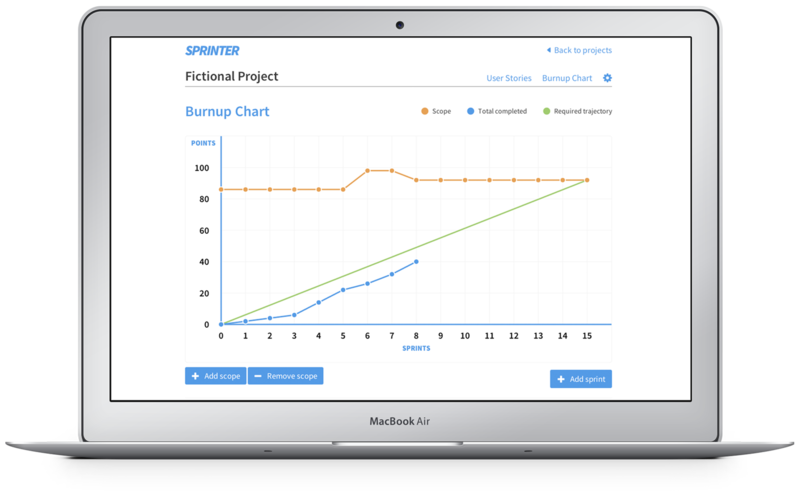 Sprinter is a tool to help make informed decisions when running Agile projects by allowing users to input their tasks (or stories), record which of these have been completed each week (or iteration), add or remove scope along the way and then see their burnup chart automatically adjust to reflect these changes.